All entrepreneurs without exception are keen to grow their business and sooner or later start looking for more efficient and quicker ways to sell their goods and services. How can you beat your competitors without breaking the law and increase your clientele? Our law office offers you a professional and solid solution to this challenge. Use our services to participate in tender competitions and auctions organised by both state authorities and public sector undertakings. Participation in tendering procedures will help your company win new lucrative contracts. You will be able to expose your products and services to a larger audience, enter new markets and, as a result, generate more profit, which is the ultimate aim of any business venture. It is widely believed that to make successful bids one needs to be well connected. Nowadays, however, the outcome of a competition is determined by legal correctness of the tender, the price and quality of the goods and services offered by the supplier and the experience and expertise of the specialists involved in preparing the tender. If you are determined to put in effort and hard work, you stand a far better chance of winning! The participation of your company in a tender competition will give you the opportunity to increase your turnover and client base! Our law office provides legal assistance with daunting paperwork to both seasoned companies and fledgling businesses. Legal analysis of tender documentation for public procurement contracts and correct preparation of bids may cause difficulty even for experienced suppliers, let alone new-comers. For the latter, profession help and advice is absolutely indispensable. It is our utmost priority to deliver the best possible outcome for every single one of our clients! Your tender will include all the necessary information based on which the buyer will be able to choose the appropriate supplier. A correct tender prepared in a timely fashion is essential to successful participation in a tendering procedure. Unfortunately, even the most attractive bid may be rejected on purely formal grounds despite it offering a real value for money or a superior all-in-one solution. That is why you should take great care in preparing your tender. Put yourself into the hands of professionals, and your moderate expenses will soon return a profit! if necessary, help you with the paperwork required to obtain a bank guarantee, etc. The cost of the services listed above depends on the volume and complexity of work. – We are always looking for new approaches to optimise our work flow and address the challenges you give us in the most effective manner. Why are we able to provide better services at a lower price? Please note that although professional support provided by our lawyers specialising in tender assistance will increase your chances of winning, even the most skilled professional cannot work miracles and just deliver the desired win on a silver platter. Our law firm never makes unrealistic promises to its clients because there can be no guarantees in a tendering procedure based on fair play. So if others promise you a sure win, beware! There is every likelihood that you will be tricked or drawn into something illegal. – We always honestly explain to our clients that we can ensure correctness and compliance with all the requirements but we cannot guarantee the outcome. – Our key values are integrity, openness and high professionalism of our lawyers. If you decide to work with us, you will see these values in operation. The supplier with the best bid wins the contract, and we will use our best endeavours to make sure that you are the one who puts in the best bid! We offer full legal assistance at every stage of the tendering process from searching for suitable contract notices on official websites to executing the contract awarded. We will analyse contract notices which may be of interest to your company and find contracts matching your business profile. 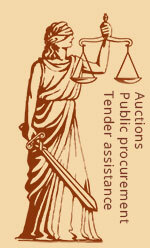 We will devise an effective strategy for your participation in a tender competition or an auction. We will provide tender assistance with minimum risk, within the agreed time limit and at a reasonable cost. Our highly competent specialists will handle all the paperwork in constant cooperation with you. If your tender proves successful, you can rely on us for guidance and support throughout the period of the contract. Your success in a tender competition will be a highlight both in your and our portfolio and will far outweigh any orders you may receive through direct selling!